A while back during our 100+ degree days it was pretty much a necessity to spend time inside unless you got up at the crack of dawn. I am not a crack of dawn person, but I do admit to trying it for a few days. While it was nice, I prefer my leisurely, retired person mode of getting up when I feel like it and beginning my day! 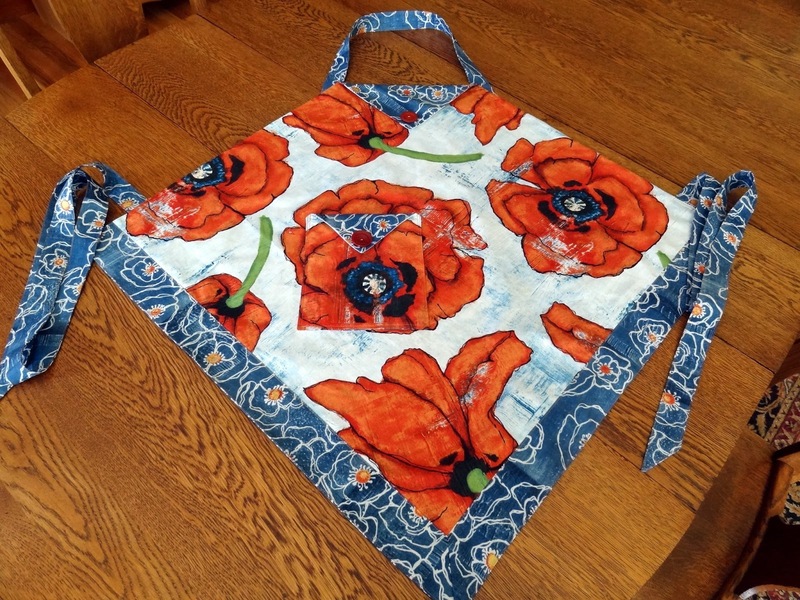 I have had fabric and patterns for two aprons for some time now and though this was the perfect time to make them. This bright little number is the Four Corners Apron from Vanilla House Designs. The reverse side is the darker blue print. I used vintage buttons given to me by a dear friend! This is also a reversible apron by Whimsicals called My Little Apron. I used a new fabric line called Happy Go Lucky by Bonnie and Camille. The pattern calls for rick rack around the pockets and bottom, but the print I used looks so much like rick rack that I thought I would let it speak for itself. Here is the reverse folded over. I love garment sewing! It gives me a chance to practice all the skills my Lithuanian grandmother who was a men's tailor taught me. We had a lovely Fourth of July - hope you did as well! 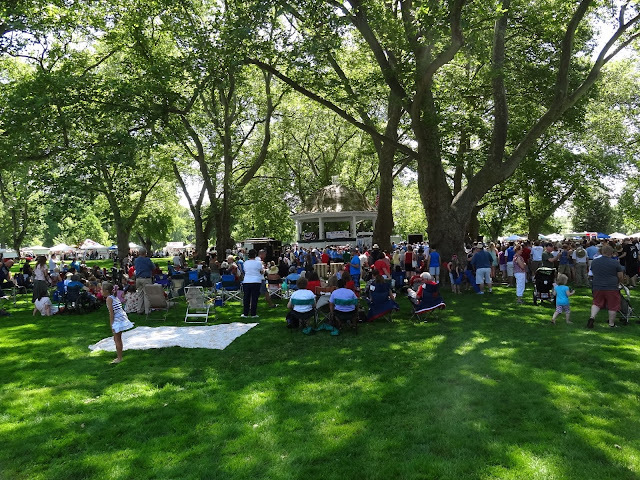 We walk a block and a half to the big park in town, wander around the booths, listen to music from the 100 year old bandstand and enjoy people watching! 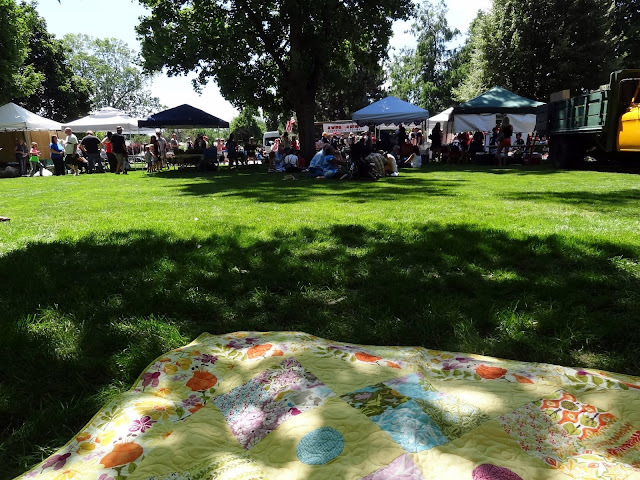 This time I thought to bring our Picnic Quilt - Barefoot in the Park (one of my most favorite Supreme sewing gigs) - so we could have a nice spot in the shade to eat and relax! 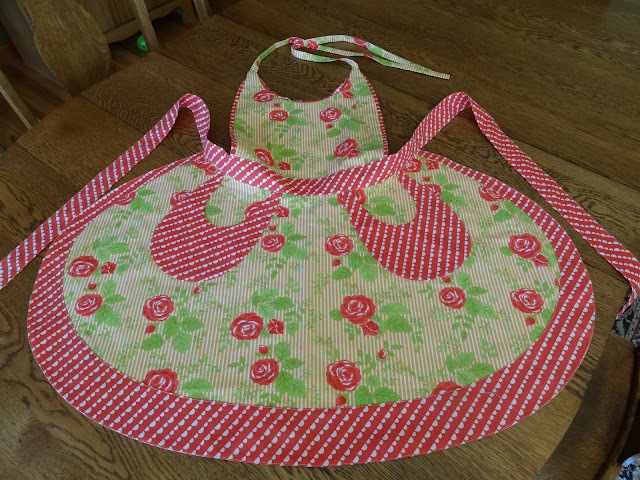 Fabulous and fun aprons and the perfect fabric choice for each one. On occasion I wish I had the skills to sew garments. Your picnic quilt makes me smile. Stay cool. Your aprons are so sweet, sometimes it nice to make something not quilty. Such an appropriate quilt to bring to your July 4th outing. What a neat park and way to spend the 4th. I like that easy, slow start to my day as well. 'Course, before you know it, its noontime, too!! Love those aprons, esp the first one - it's a fun design. Glad you had a good 4th and that there was shade to sit in, thankfully the extreme heat had stopped before the holiday. Hugs!! Did everyone ooh and aaw over your picnic quilt? I'd be surprised if they didn't because the colors look wonderful against the green grass. I don't sew garments. I doubt if I'd have the patience because I certainly didn't in my home ec classes in high school. Your aprons remind me of my gran. An apron was a part of her everyday wardrobe and she made each and every one herself...by hand if you can believe it! She'd love yours! such cute aprons. 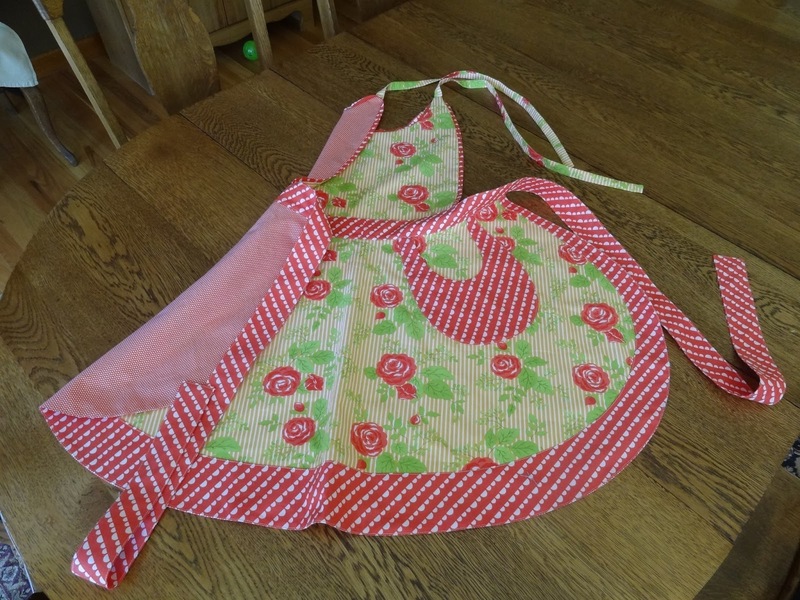 I do love the curve on the rose apron. A very pretty quilt to sit on while enjoying your day at the park. Those aprons are so sweet and I love your picnic quilt. Your aprons are adorable! Your grandmother taught you well! And what a wonderful way to spend the 4th of July...your picnic quilt is so pretty! Lovely aprons! The pink one is just too cute., I agree that you don't need the rickrack with that border fabric. Love the picnic quilt too! How convenient to have a beautiful park like that within walking distance! Great aprons! I don't do garment sewing, so when I want something like that I have to sweet-talk my Aunt Nancy!! Glad you had a fun 4th! So pretty! I very rarely wear an apron but wish I had a place in my small galley kitchen to hang one like yours up for ambiance :) Looks like a great small town 4th. Love your Barefoot quilt--I have some fabrics set aside to make a Christmas version of that pattern. Beautiful aprons! I always wear one for kitchen work but mine are plain and simple. Great weather for a festive picnic! My grandma was a men's tailor, too! She had a thriving business during WWII doing alterations on soldier's uniforms at the nearby Army training base. She did beautiful women's garments, too.